“For what saith the Scripture? ‘Abraham believed God, and it was counted unto him for righteousness’” (Romans 4:3). In these words we have the essence of the Gospel of God, and of His Grace. That Gospel is explained in Romans 1:1 to be the “Gospel of God.” God’s Good News; and faith cometh by hearing it. This is the Gospel that Abraham believed; he believed God; believed what God said. The patriarch’s feet were firmly planted on God’s ground; his eyes were fixed on God Himself. He had no shadow of doubt as to his possessing, in due time, all that God had promised. He did not hope it, still less did he doubt it, or go on asking for what God said He had given. Oh! how few comparatively among the children of God really believe God, and without any reserve take this blessed ground of having died with Christ, of being risen with Christ, of being forgiven all sins, accepted in the Beloved, and sealed by the Holy Spirit! At times they hope it; when all goes smoothly with them they can venture to speak hopefully, but when things go against them, they feel the working of the old nature, and at once they begin to reason about themselves, and to question whether after all they are in reality the children of God. From such reasonings the passage to despondency and despair is an easy one. All this is destructive to peace, because it is dishonouring to God. It is impossible to make progress in this condition. How can one run a race if he is not sure whether he has started? How can one erect a building if he has not laid the foundation? How can any one grow in grace if he is in doubt whether he has life, or has been “planted“? But some may ask, “How can I be sure about this? How may I know that I am saved?” The answer is, How do you know that you are a sinner and need saving? Is it because you feel you are one ? Possibly so, but feeling is not a ground of faith; faith that is based on feeling is not a Divine faith at all. “Faith cometh by hearing.” Faith must have respect to a promise not to a feeling. True faith rests on the testimony of God’s Word. No doubt it is by the gracious energy of the Holy Spirit that any one can exercise this living faith, but we are speaking now of the true ground of faith, the authority for faith, the basis on which alone it can rest, and that surely is the Word of God, which is able to make wise unto salvation without any human intervention whatsoever. There is scarcely a point on which Religion is more opposed to Christianity. Religion makes the word of God of none effect by its tradition and its superstition, and is thus in direct hostility to the truth of God. Religion has to do with the flesh; it admits that there is a Divine revelation; but it denies that anyone can understand it save by the interpretation of man; or, in other words, the Word of God is not sufficient without man’s authority. God has spoken, but I am told I cannot hear His voice or understand His Word without; human intervention. This is Religion! Infidelity, on the other hand, boldly denies a Revelation; it does not believe in such a thing. Infidels can write books, they can tell us their mind, but (so they say) God cannot! But where is the difference between denying that God has spoken, and maintaining that He cannot make us understand what He says? Both are alike dishonouring to God. Both deprive man of the priceless treasure of His Word. Both exalt the creature and blaspheme the Creator. Both alike shut out God, and rob the soul of the foundation of its faith. This has ever been the device of the enemy, to quench the light of inspiration, to plunge the soul into the darkness of infidelity and superstition, to set aside the authority of the Word of God by any means in his power. He cares not by what agency he gains this end. Witness how he brought about the Fall by casting doubt on the Word of God. “Yea, hath God said?” It is therefore very important for us to seize this great fact which is brought out in our text, “Abraham believed God.” Here was Divine faith. It was not a question of feeling or Religion. Indeed, if Abraham had been influenced by his feelings he would have been a doubter instead of a believer. For what had he in himself to build his faith on? “His own body now dead” (verse 19)? A poor ground surely on which to base a faith in the promise of an innumerable posterity. But we are told that “he considered not his own body now dead.” What then did he consider? The Word of the living God, and on that he rested. This is faith. Oh! what solid comfort is here, what rich consolation! It assures the anxious one that he has the self-same ground and authority to rest upon that Abraham had, with much more light than Abraham had. For Abraham was called to believe God’s Word as to what He promised, whereas we are privileged to believe in a fact which God has accomplished. He was called to look forward to something yet to be done; we look back at something that has been done, even an accomplished redemption attested by the fact of a risen and glorified Saviour, seated at the right hand of the Majesty on high. But as to the ground or authority on which this faith is to be based, it is the same in our case as in that of Abraham — the Word of God. So it is written, “faith cometh by hearing, and hearing by the Word of God.” There is no other foundation for faith but this; and the faith that rests on any other foundation is not true faith at all. A faith resting on human tradition, or on the authority of a Church, is not Divine faith; it is a mere superstition, it is a faith which stands in the wisdom of men, and not in the power of God (I Corinthians 2:5). It is impossible for us to overstate the value and the importance of this grand principle, the ground of a living faith. This is the Divine antidote to all the errors, evils, and hostile influences of the present day. There is a tremendous shaking going on around us, and it will grow worse. Minds are agitated; disturbing forces are abroad; foundations are being loosened; institutions are tottering; souls which found shelter in them are being dislodged and know not whither to turn. Confusion and judgment is written on all things ecclesiastical and political. What is the one thing that we need? Simply this. A living faith in the living God! This is what is needed for all who are disturbed by what they see without, or feel within. Our unfailing resource is this, trust in a living God, and in His Son Jesus Christ, revealed by the Eternal Spirit in the Scriptures of Truth . Here is the resting-place for faith. Here we solemnly exhort you to stay your whole souls. Here we have authority for all that we need to know, to believe, and to do. Is it a question of anxiety about your safety? Hear the Divine words, “Wherefore also it is contained in the Scriptures: Behold I lay in Zion a Chief Corner Stone, elect, precious, and he that believeth on Him shall not be confounded” (I Peter 2:6). What solid comfort is here, what deep, settled repose! God has laid the foundation, and that foundation is nothing less than His own Eternal, co-equal Son. This foundation is sufficient to sustain all the counsels of God, to meet all the needs of the soul. Christ is God’s own precious, tried, Chief Corner Stone. That blessed One who went down into death’s dark waters; bore the heavy judgment and wrath of God against sin, and robbed death of its sting, and, having done this, was raised from the dead, was received up into Glory, and is now seated at the right hand of the Majesty in the Heavens. Such is God’s foundation to which He graciously calls the attention of every one who really feels the need of something divinely solid on which to build, in view of the hollow and shadowy scenes of the world, and in prospect of the stern realities of the future. In short, it is no more and no less than believing what God says, because He says it! It is committing your self to the word of Him that cannot lie. It is doing exactly what Abraham did. 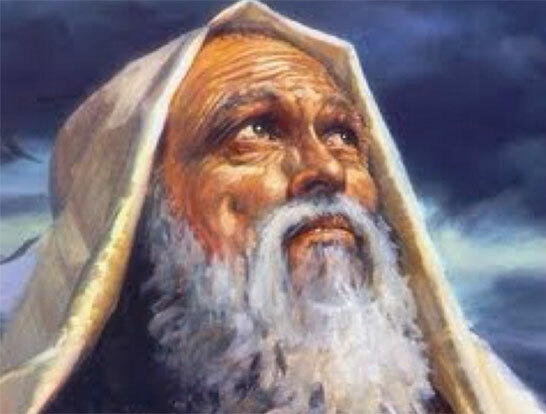 “Abraham believed God, and it was counted unto him for righteousness.” It does not say Abraham understood God, because he did not; nor that Abraham believed something about God, but Abraham believed God, i.e., what He said. Thus he lived in peace with God, and died in the hope of Resurrection, of a Heavenly City, of a Heavenly Home. It is resting on the immovable rock of Holy Scripture, and thus proving the Divine and saving virtue of that which never failed any who trusted to it, never did, and never will, and never can. Oh! the unspeakable blessedness of having such a foundation in a world like this, where death and decay and change are stamped upon all, where friendship’s fondest ties are snapped in a moment by death’s rude hand, where all that seems (to nature’s view) most stable is liable to be swept away in a moment by a popular Revolution, where there is absolutely nothing on which the heart can lean and say, “Now I have found permanent repose.” Oh! what a mercy in such a scene to have a living faith in the living Word and in the written Word of the living God. This entry was posted in Bible Teachings, Inspirational Messages and tagged Abraham, believing, Christ, Faith, Father, God speaks, heavenly city, hope, Jesus, mercy, promise, return, staggered not, trust. Bookmark the permalink.